Just ordered your book…can’t wait! Began my journey to remove dairy, soy, and meat a couple of months ago…I convinced my husband to give up meat and sweets for a couple of weeks and he’s lost 20 pounds…your cookbook will add variety to our palates! Hey Taymer! I was wondering if you wold consider selling a PDF downloadable version of your cookbook? It’s great to have the hard copy in a kitchen, but I like having the e-copy for when I travel, etc. Plus it would be more affordable for some of us! Just a thought! Or I guess a request! Hope you feel better soon! The lentil patties look WONDERFUL and when you suggested them to me when I went to Barbados they were an almost daily staple along with Roti. LOVED them! Oh my! I really wanted to get your book before Thanksgiving so I could make the macaroni pie, but the Barnes & Nobles says they won’t get it until December 1. Anyway, I just ordered it through Amazon.com. Guess they will have to do without that dish this Thanksgiving. I’m looking forward to trying it though. I happened upon your book last week and made the immediate decision to buy it. My SO is a Bajan vegetarian (living here in the States) missing some of his childhood foods. I made the Tofish with cou cou. We both enjoyed it completely. I loved the cou cou, which I had never even eaten before. The sauce was perfect for it. Next I intend to try the Bajan macaroni pie. I’m really glad I found the book and the blog and am looking forward to trying more recipes. We would also like to go to Barbados in the near future so I will check back for your travel tips. I can not wait to get your cook book…I have been wanting to give up meat for so long…but I need good tasting foods…and I think I have found it…can you order it from Amazon? I not please place it there that is how I order all my books. Can’t wait. Yes, it is there on Amazon..I ordered me one…thanks! Will up date you on how I like it. I was at a local bookstore a few weeks ago when I saw your book for the first time. I was thrilled because I thought I’d have to make Jamaican vegan dishes from scratch. I’d succeeded in making my own Jamaican Patties but everything else I didn’t have the motivation for. I saw your versions of the patties and was also inspired. I’ll be making these sometime in the future. Maybe for my birthday? Anyway, thanks for making this book. Thanks for the feedback. May I point you to another publication Delicious Jamaica which is a vegetarian cookbook with all things Jamaica. The Caribbean is not Jamaica as you know and I wanted to go beyond the scope of most cookbooks which neglect to expose readers to other islands who also have vegan food and whose dishes could be vegan. With that said on the fan page there are calaloo fritters recipe which is very Jamaican. There is also Jerk Sausage, Jerk Seasoning, Ackee Scramble and Jerk Pizza or Happy Pizza as I would call it in the book. Dishes like manish water were out of the question.I am working on a recipe for Jamaican Coconut Bake which was suppose to be Caribbean Vegan but I was on a deadline and it basically missed the boat. After hearing persons ideas about Caribbean cuisine only jamaican food and fish. I am sorry the book is not as Jamaican heavy as you were expecting also please note the patties in the bookhave a lowfat crust. I am planning on doing Jamaican patties one day on the blog meaning the full fat ones as the blog is an extension of the book and one day if there is a second edition some recipes that came after the book will be included. I really appreciate you buying the book and please give your feedback when you start to get into it and I am free on fb and twitter if you have problems making a start. Thirty years ago there were a couple cookbooks, but nothing as exciting as yours 30 years later! I checked your book out at the library and went online to purchase. Thank you for the comment. I am thrilled you as a long time vegetarian found joy in this book and I will be rolling out more recipes on the site as an extension of the book so look out for that soon. As a Jamaican vegan living in Jamaica with my Bajan vegan wife and children, can I buy the book in Jamaica? 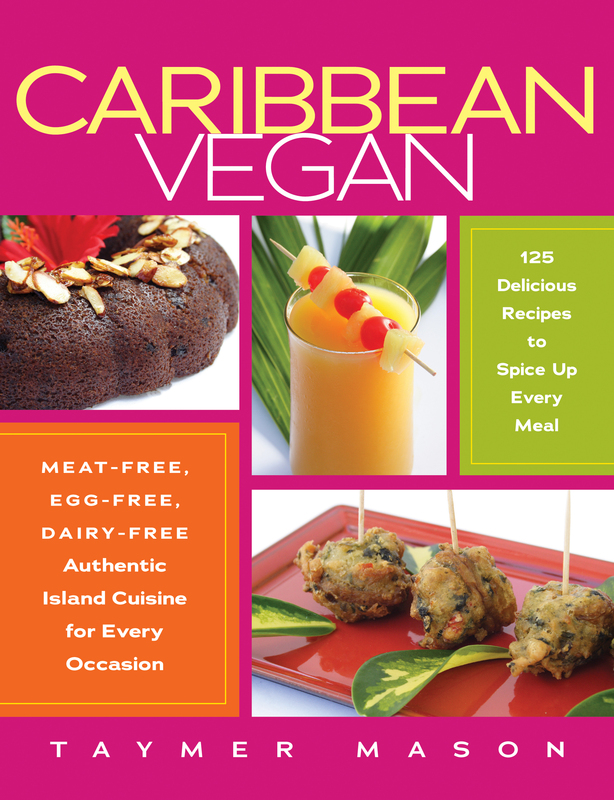 My primary aim to to have Caribbean Vegan in every bookstore in the Caribbean by the end of the year. I have requested a list from the publishers for the store in the Caribbean that are currently carrying this book and I have not received it as yet. I will be trying to get a small shipment down to Jamaica if they keep me waiting as I have some contacts for bookstores and my Jamaican followers have been waiting for this title for a while. Give me about a week to get back to you Sheps. Did you get the book into a bookstore in Barbados? Love your book! I got it from amazon. The only thing that saddens me a bit is that no recipe from Haiti or the Dominican Republic are mentioned. I live in the DR and both here and in Haiti there are some good vegan dishes too. But still, it’s a great book. Love that the recipes include so many locally-grown ingredients. Is your book ‘Spiral Bound’ for easier use in the kitchen? If not, please consider that so the book would be able to lie flat and/or fold. I’m about to buy your book, but have only one question. I’ve read that people lost a lot of weight with a vegan diet and I’m too thin already. Would you recommend your book for someone like me? Can you help me as to which bookstores I can find this book in Barbados?